Lately, I have been doing a fair amount of catering. Some of it has been real official catering and some of it has been making food for lots of people on behalf of friends. Either way, I am always faced with the challenge of how much food to make. Working as a personal chef for three years and also catering lunches, dinners, and parties – not to mention all the entertaining we do ourselves – has made me a pretty good judge of portions. I have no formula, I just kind of guess. (Very scientific, I know.) If I’m not sure, I err on the side of too much food because leftovers are nice but being hungry because the hostess/chef/caterer didn’t make enough food is not. Once in a while I am off but thankfully not very often. My parents came over for dinner last night along with my brother Michael. Both of my brothers have incredible appetites and if they like something, you had probably better duck for cover. My brother Alex once went to a wedding where he ate 99 skewers of shrimp with each skewer holding three shrimp. I do know he did not get sick. I do not know if anyone else got any shrimp that night. Anyway, Michael, the baby in the family, also loves food and I always like to send him home with leftovers. Keeping that in mind, and knowing I was cooking for five last night, I decided to one and half the recipe for these Spicy Peanut Noodles. Just a pound and a half of noodles. That should be right for five hungry people with a few leftovers, right? If I were making this pasta or this one, I wouldn’t hesitate to use a pound and a half of pasta. I usually scoff at using spaghetti in Asian dishes, but I had some on hand and I like that the Barilla noodles have quite a bit of protein in them. Their nutty flavor was most welcome in this dish, I just cooked them past al dente so their texture would be right. No tofu was in the recipe originally, but I liked it here. I held back a bit of the peanut sauce, brushed both sides of the tofu with it, and baked it in a 375º oven for about 25 minutes. I also added the slightly pickled carrots because I thought the dish could use an extra bite and a bit of color. In a blender, puree the peanut butter with 6 tablespoons of the vinegar, 3 tbsp of the sugar, the soy sauce, water, sesame oil, crushed red pepper, ginger and garlic. Remove about ½ a cup of the dressing and place in a pie dish. Put the tofu slices in the dish and turn them to coat with the dressing. Place dish in the oven and bake for 15 minutes. Remove and turn the slices over. Bake for another 10 minutes. Remove from the oven and set aside. In a pot of boiling water, cook the spaghetti until tender. Place the remaining dressing in a large bowl. Using tongs, scoop the spaghetti out of the water and into the bowl. Toss to coat the noodles with dressing. Ladle in some of the cooking water if the noodles seem too dry. In another bowl, toss the celery with the cilantro and 2 tbsp. of vinegar and 1 teaspoon of sugar. Do the same in another bowl with the carrots and remaining vinegar and sugar. Drain if they seem too wet, but allow them each to sit in their liquid for at least 10 minutes. Serve the noodles in bowls and top them with the celery and carrots. I’m pretty sure I could eat peanut sauce every day for the rest of my life and not get bored. In fact, I spend a fair portion of my time looking for the perfect recipe. I’m going to have to try this. Maybe it was the fat in the peanut butter that just made them feel full faster and so you had a lot left over? Hmmm. I know that if I made a pound and a half of pasta for my family of five…it would be gone with hungry people still left over. Especially since my brother is a bottomless pit. How funny, I just made this dish (with a slightly different recipe) yesterday! I love the addition of ginger and the side of tofu. Perfect deck-weather food! I love the color from the carrots. I am always in the mood for a good noodle dish like this one! This dish sounds amazing. I would feel so lucky to be a member of your family! Looks great! I’ll be making this tomorrow night. Always nice to be inspired with some beautiful pictures. Noodles in any form are a hit around here, and I haven’t made peanut noodles in a long time, can’t wait to try your recipe! The carrots sound delicious on it. Isn’t is great how sometimes pasta seems to multiply? I love having leftover dishes like this. The tofu with the sauce sounds fantastic too. This looks really good right now — I like the pickled carrots. 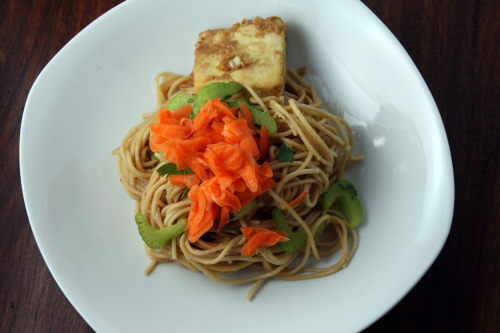 Peanut noodles are in my top 5 favorite foods and I am always changing up the recipe. Will try this next round! PLus it will give me an excuse to pickle something! This is the kind of dish I crave! 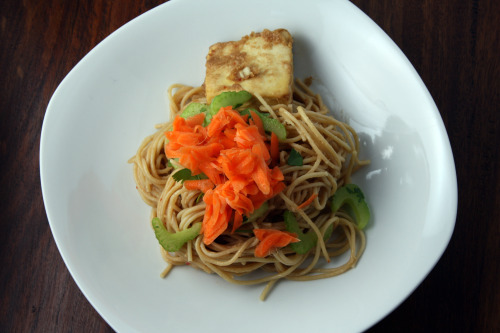 Peanut butter, noodles, spice and pickled carrots, yum! I had to make this last night because it was calling to me. I adapted to use what i had and instead of celery, stir fried some baby bok choy and chicken to go along with the noodles. Sofia loved it and I had enough leftovers for lunch today. Thanks Dana. I am a nursing mom that has been craving peanut butter non-stop! So, I made this last night. It was fantastic, nicely balanced between the sauce, starch and pickled veggies. I also loved that there was plenty of sauce to cover the noodles, that does not always happen–perfect portions. how did i miss this?!!! it looks amazing. Dana, this is so good, we ate it two nights in a row! I’m always wary when it comes to peanut sauces because I don’t really like them at Thai restaurants for some reason, so I halved it the first time and used some cooked kale in place of carrots. The second time I made the full batch! delicious! i love these. and speaking of leftovers, I particularly love them when they’re cold. Yum I never get tired of Asian noodle dishes! Or peanut sauce. I love that you topped these with pickled carrots. Made this tonight with bok choy replacing the celery- everyone loved it.